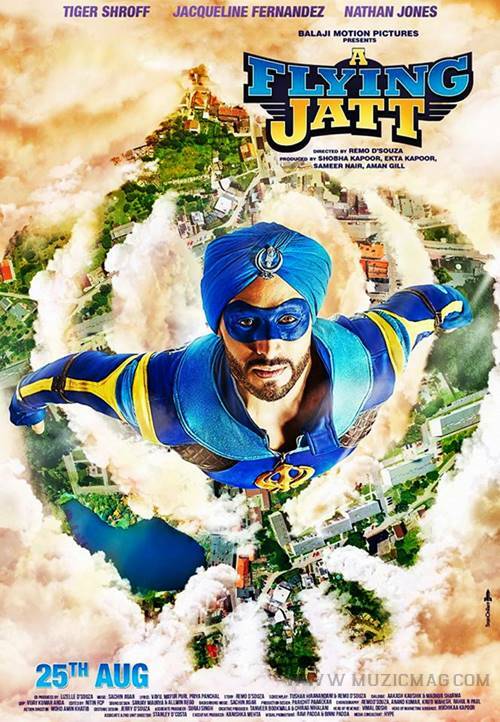 New poster and teaser of ‪A ‎Flying Jatt is released. Movie‬ features Tiger Shroff and Jacqueline Fernandez in lead roles, directed by Remo D'souza. ‪‎Tiger Shroff‬ is going to be the youngest superhero in the Indian Film Industry! People are appreciating the poster of A Flying Jatt with Tiger Shroff having Sikh Turban on his head but there are fans who're worrying about him. One of his fan wrote "Dear Tiger you have started very well in this industry but be cautious in choosing scripts, coz there are several others who started well but they are not cautious in choosing scripts & declined themselves later. Hope you understand." Jacqueline Fernandez revealed her excitement quoting "What can I say about these guys without getting emotional so proud to have been directed by @remodsouza this movie has been like a dream and I'm really going to miss my ‪#‎flyingjatt‬ family @tigerjackieshroff you were the perfect superhero and such an inspiration to me and I'm so happy you finally had some cake!! ‪#‎itsawrap‬"
The motion poster of the same is out. Have a look!